We’re now into the shoulder season of mountain hiking, and as much as I love heading up into the snow and ice, I just don’t find myself making it out onto the trail as often as I do from Spring to Fall. In order to maintain my strength and endurance, I make sure to increase my gym and track time to make up for the hours I’m missing at altitude. In this post, I’ll be covering 3 exercises to help you build and maintain your strength on the track. 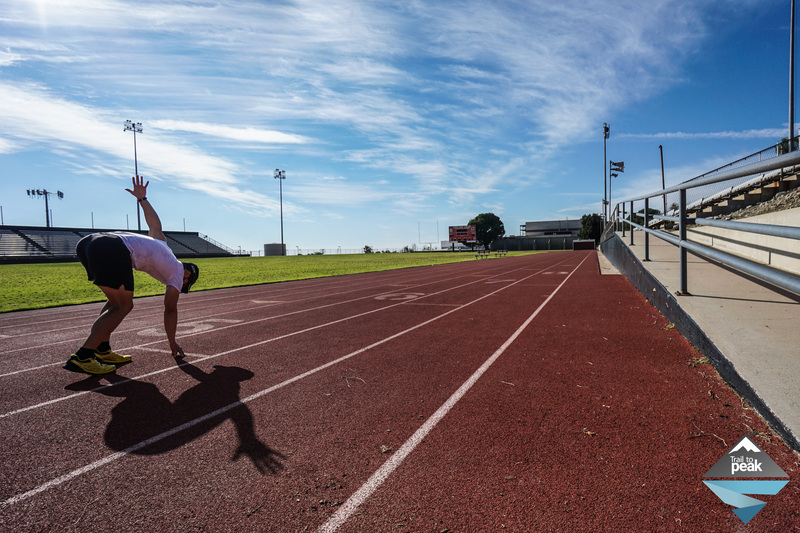 Before any track workout, you’ll want to start by getting warmed up. I’m a huge fan of dynamic flexibility and don’t suggest trying to use static stretches for cold muscles. Static stretches are best left for your post workout routine. For each exercise in the dynamic flexibility routine below, you perform the exercise for 15 meters, and then jog out another 15 meters so that each exercise totals 30 meters. To get started with my track workout I like to begin with small hurdles. If you don’t have small hurdles, you can use anything around 8 inches high that is easily stepped over. I’ve used shoes, water bottles, and even sticks when I don’t have my gear with me. The key here is to work on quick and explosive movements. Don’t just jump, explode with each movement. When you’re doing compound movements, don’t take time to settle. Keep your feet popping with force for every move. For the hurdle progression below, you’ll want to use a timer. Set your watch for 1 minute, and perform each exercise until the alarm sounds. Take a 1-2 minute break in between each exercise. 1 minute each exercise. Go through circuit twice. The sprint circuit is my favorite way to build top end stamina and power. This is probably the most demanding part of my track session, so make sure to take a nice rest after completing the hurdle circuit. Your muscles should be nice and warm at this point, so get ready to push it. The tracks I frequent don’t make starting blocks available to the general public, so I use my old 40 yard dash three point stance. You can start from a two point stance if you’re more comfortable. Just get into a position where you can explode from your start and reach top end speed as quickly as possible. The main focus is to have one foot forward with the opposite hand as your ripcord. Reference the photo of me below. My left foot is forward and my right foot is back. When I start, my right leg rips forward with maximum force, and my left arm rips forward in balance. My right arm with go back to mach my trailing left leg. Another major component of my sprinting routine is bounding. Bounding helps build phenomenal balance and power in your leg muscles, while also improving your cardiovascular strength. If you’re not familiar with bounding, it’s an exaggerated high knee sprint movement that is similar to a sprint. Here is a link to a video if you need a visual (link). Use a 100m lane for this progression. Finish your sprint, then turn around and finish your bounding set without a break. Only take a break once you’ve completed your sprint and bounding combo. I like to use my heartrate to judge my breaks for these. I usually find that somewhere around 110 bpm means I’m ready for the next sprint/bounding set. At 10 total sets, your legs should feel pretty blitzed on that final bounding run! To finish off my track workout I like to do a cardio session on the bleachers. The hurdles and sprints focus on building power and high end stamina, the bleachers help with more long term endurance and strength. To start, we keep up our sprinting and focus on one track of stairs. After that, we’ll incorporate the entire stadium for a timed endurance run. For this first progression, you’ll be sprinting to the top of the bleacher set (20-30 stairs are ideal) and walking back down for a break. Make sure to really explode and drive the arms on every set. The second bleacher progression is more of an endurance run. I like to run for 20-30 minutes, but you can set a time based on your current endurance and desired output. For these bleacher runs, you’ll be hitting every step, trying to get into your flat land running cadence. I like to run up and down each row of column of steps on one side, run the curve of the track, run up and down each column of steps on the other side, hit the other curve of the track, and repeat. These are the 3 track exercises to build strength and endurance for the mountains. I know this topic is a bit of a departure from the standard hiking, travel, and gear I usually write about. Fitness is something I’m deeply passionate about, and I’d love to write more posts on exercise, gear, and diet advice to help you prepare for all of your mountain related activities. Let me know if you liked this post and if you’d like to see more like it in the future. I think this is great! Although, I’m going to have to start at a more modest level. I’m also curious to read about your diet. Keep up the great posts! Thanks, Melissa! I’ll be doing a few diet related posts this week. I figured the timing was right with all of the New Years resolution talk coming up.